Thanks to BBC Good Food! 1Roast the sweet potato whole in a 350F oven for about an hour (this can be done while something else is baking). Cool and cut into 1/2" slices. If you like, brush them with oil. 2Preheat the grill to medium-high and grill the slices of sweet potato until char-marked on each side. 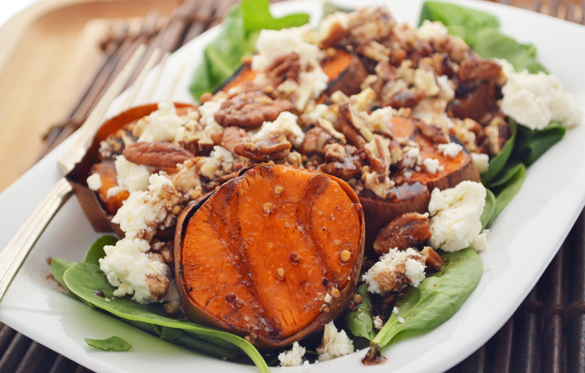 Lay the spinach out on a plate, and layer with grilled sweet potato slices and slivered onion; scatter with feta and nuts. Whisk or shake together the dressing ingredients and pour overtop.